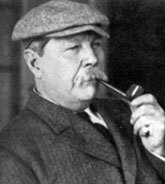 Partway through his writing career, Arthur Conan Doyle killed off his most famous literary creation, the ultra-rational detective Sherlock Holmes. The sleuth was taking attention away from the author's more important works of literature, Doyle thought then. Later he gave in to widespread pressure, bringing Holmes back to life on the page. But he also came around to thinking his greatest work for humankind was in a field altogether different from literature: in revealing the supernatural world. I don't know how he would take the news today, s century later, he is known almost exclusively for the fictional exploits of that one character who refused to stay dead. The four novels and fifty-six stories featuring Sherlock Holmes have never been out of print, still sell in new volumes that appear almost annually, and have inspired over five hundred movies and television episodes that debut every year. Not to mention the dozens of writers who have created additional stories and novels featuring Holmes. And not to mention the entire field of mystery and crime fiction that continues to draw on the templates laid down by Doyle in the Sherlock Holmes stories. Any popular writer would be more than gratified to have been credited for creating such an influential and enduring character. But what a strange character to attract such acclaim—even idolatry. Sherlock Holmes is a man of many startling contradictions: Einstein-brilliant in areas related to his work and an ignoramus in others. A defender of Victorian values of order and loyalty, and a slovenly, self-absorbed, thrill-seeking drug addict. Insufferably superior but painstakingly sensitive to human nature when it serves him. A driven, passionate man with few if any of the normal emotions. A machine without a heart, Doctor Watson called him. That Doyle was able to make this nearly inhuman monster the subject of our continued interest is the achievement for which he is not sufficiently recognized—not even by himself. He complained the popularity of Sherlock Holmes was keeping him from receiving his due for his more literary work. In his mind the creation of Holmes-styled mysteries was simply a matter of devising ingenious plots to be unravelled by his leading characters who never changed. Unlike literary work that focuses on explication of character, these narratives depended on figures who never grew from story to story, seldom revealed new nuances or untold depths. It takes some kind of writer to accomplish this and Doyle's actual writing skill in the Holmes mysteries is not always well appreciated. His literary reputation is treated as though he were just lucky to latch onto a catchy character. Doyle was a born storyteller. Although the plot points of his Holmes stories utilize certain elements necessary to the genre (which he was instrumental in establishing), when you read the stories end to end you realize how much he experiments in organizing those points. Invariably he finds new ways to make them work as stories. "It is murder, Watson—refined, cold-blooded, deliberate murder." Such a direct style applied to his foremost character, often in words placed in Watson's voice, means we never get the sense that Doyle is making him up. The otherwise bizarre contradictions of Holmes appear as perfectly compatible in this perfectly understood and realized character. Today we may understand Holmes almost as a sociopath—like Patricia Highsmith's masquerading Ripley character or Jeff Lindsay's killer of killers, Dexter Morgan—though operating within the moral bounds of his society. The device of having the stories purportedly told by the stalwart and cleverer-than-he-makes-himself-appear Doctor John Watson can be credited in part for this success. Doyle's non-Holmes stories, without this narrative filter range from dull to interesting, but they never enchant the way the best of the Holmes and Watson stories do when the game is afoot. From time to time, Doyle has his peerless detective complain about the doctor's sensationalizing of his cases, perhaps reflecting Doyle's own misgivings, but his writing without Watson's perspective tends to be stodgier, less engaging. Like Watson, Doyle studied medicine, but poverty as a practitioner in England led him to try writing. He published stories of various kinds in magazines and eventually produced A Study in Scarlet (1887), a short novel introducing the famous detective and his purported future chronicler. The character of the gentleman who used minute observation and deduction to reveal hidden truths about people is said to have been based on a doctor, Joseph Bell, with whom Doyle trained as a medical student. A Study in Scarlet appeared in a Christmas annual magazine and then was published in book form, but it was not particularly noted. A similar fate befell a sequel, The Sign of the Four (also called The Sign of Four, 1890), which expanded the Holmes universe to include the Baker Street Irregulars. It was his short stories about Holmes, published in The Strand Magazine starting in 1891 and later collected in The Adventures of Sherlock Holmes (1892) that started a popular following for the consulting detective. So his next collection of stories, The Memoirs of Sherlock Holmes (1893), ends with the tale "The Final Problem", in which Holmes is killed. Doyle spent the next years writing his supposed great works, some of which actually were quite good. His play A Story of Waterloo (1894) was a big success on stage. The Exploits of Brigadier Gerard (1903) is a collection of stories written over the past decade satirizing a vainglorious soldier in Napoleon's army. Sir Nigel (1906) is a sort of prequel to The White Company and Doyle thought it surpassed the earlier novel, though it proved less successful. His boldest works of this period, however, were not fiction. During the war between the British and the Boers in South Africa, he volunteered for service at a hospital preparing for front-line service and ended up leading fights against epidemics in the war zone. As a result of his experience with ignorant British military leaders, he wrote articles calling for reforms to how Britain waged war. He also produced an objective evaluation of the campaign in a well-received pamphlet and a book, The Great Boer War (1900, revised and enlarged up to 1902). He was knighted in 1902, probably as a result of his work on the Boer War. Doyle also advocated against several miscarriages of justice closer to home, including the infamous murder conviction of a German Jew in Glasgow that led Doyle to publish The Case of Oscar Slater (1912), calling for a pardon. His long booklet, The Crime of the Congo (1909), exposed murder and exploitation by Belgian colonialists in the African state. In the meantime, two plays based on the Sherlock Holmes stories were hits at home and in America. But the public was still thirsty for new stories and the demand could be withstood. Doyle didn't exactly resurrect Holmes immediately but presented a case that took place before the detective's death. The Hound of the Baskervilles (1902) was a sensation serialized in The Strand and published as a book. It has become considered Doyle's greatest novel and has been adapted for numerous films and television shows. Then Holmes was brought back from apparent death for good in the 1903 story "The Empty House" and he continued his detecting in other works later collected as The Return of Sherlock Holmes (1905). These were followed by another novel, The Valley of Fear (1915), which only partly involves Holmes, and another collection of stories, His Last Bow (1917). The latter once again was meant to include, but did not, the final published cases of Sherlock Holmes. Twelve more stories appeared and were published together as The Case-Book of Sherlock Holmes (1927). All this time the prolific Doyle continued to produce high-quality fiction, although seldom to the acclaim reserved for Holmes's stories. The closest he came to creating an equally memorable character may be in his Challenger novels and stories. Professor George Edward Challenger makes his first appearance in The Lost World (1912), a scientist as driven and intelligent as Holmes but different in almost every other way: flamboyant, impulsive, aggressive, disrespectful of manners—a bellowing bull of a man. He leads an expedition into the Amazon basis to discover a surviving prehistoric environment. Here, we have the founding of a sub-genre of science fiction, providing material for movies and television adaptations ever since. Other Challenger works expanded the character's standing in speculative fiction, though an altogether different area of Doyle's interest began to affect this as well as all his writing. 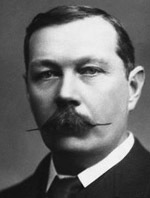 In his later life, after all his fictional work extolling rationality and his careful analytical non-fiction, Sir Arthur Conan Doyle became a great follower of the irrational. Personal tragedies led him to seek the counsel of mediums and he became a convert to the supernatural—which he clung to despite the debunking of the charlatan mediums of his day by his friend Harry Houdini and others. At the most ridiculous extreme, as shown in The Coming of the Fairies (1921), he supported the claims of two young girls who became famous for supposedly photographing fairies frolicking in the Cottingley woods. His spiritualist work he considered his most important. "From the moment that I had understood the overwhelming importance of [the reality of the afterlife] and realized how utterly it must change and chasten the whole thought of the world when it is wholeheartedly accepted, I felt...that all other work which I had ever done, or could ever do, was nothing compared to this," he wrote. The world must not have accepted this, wholeheartedly or otherwise, for his involvement in the paranormal has become his least achievement—dismissed with embarrassment, if mentioned at all. And at the top of all his many real achievements, the world still places his creation of Sherlock Holmes. Sherlock Holmes never says "Elementary, Watson" in any of the works by Doyle. Despite references to his deductive abilities, Holmes seldom uses the method of logical deduction. As any philosophy student can tell you, at best he uses induction. Or even abduction. Or just inspired guessing. Ah, well, it seems to work and it makes for good stories. Arthur Conan Doyle was not the first writer to feature a fiercely cerebral detective. Edgar Allan Poe and Wilkie Collins both had characters solve mysteries with reason. Several lesser Victorian writers also produced stories featuring the solving of crimes before Doyle entered the genre. 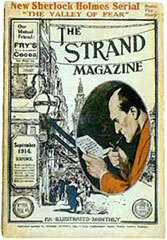 But Doyle's Sherlock Holmes is the sleuth who has set the standard for generations of fictional detectives to follow. Hundreds of detectives have come and gone since Doyle's Holmes stories, but readers (and movie and television producers) keep going back to them. The character of Sherlock Holmes continues to repel and attract. More than that, most people today probably think of Sherlock Holmes as a real historical figure. A figure of legend perhaps but with a basis in facts—like Robin Hood or King Arthur. An incredible literary achievement for a poor Victorian doctor who wanted to change the world with words, for which he should be given and should accept credit.